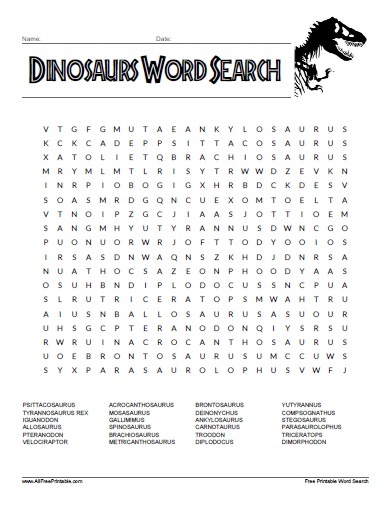 Free Printable Dinosaurs Word Search. Free Printable Word Search of the most well known types of dinosaurs. Watch the next Jurassic World movie and have fun finding all the names of the dinosaurs in this word search. Share it with all the Jurassic Park fans, friends, co-workers, family, children. Great for school, activity, science homework, birthday or just for fun. How many types of dinosaurs do you know? Check out this list of dinosaur which includes Velociraptor, Pteranodon, Tyrannosaurus rex, Mosasaurus, Triceratops, Brontosaurus, Metricanthosaurus, Spinosaurus and many more. Includes 24 dinosaurs names and the solution on page 2. Dinosaurs Word Search Puzzle is ready to print in PDF format.